Hi everyone and Happy Halloween! 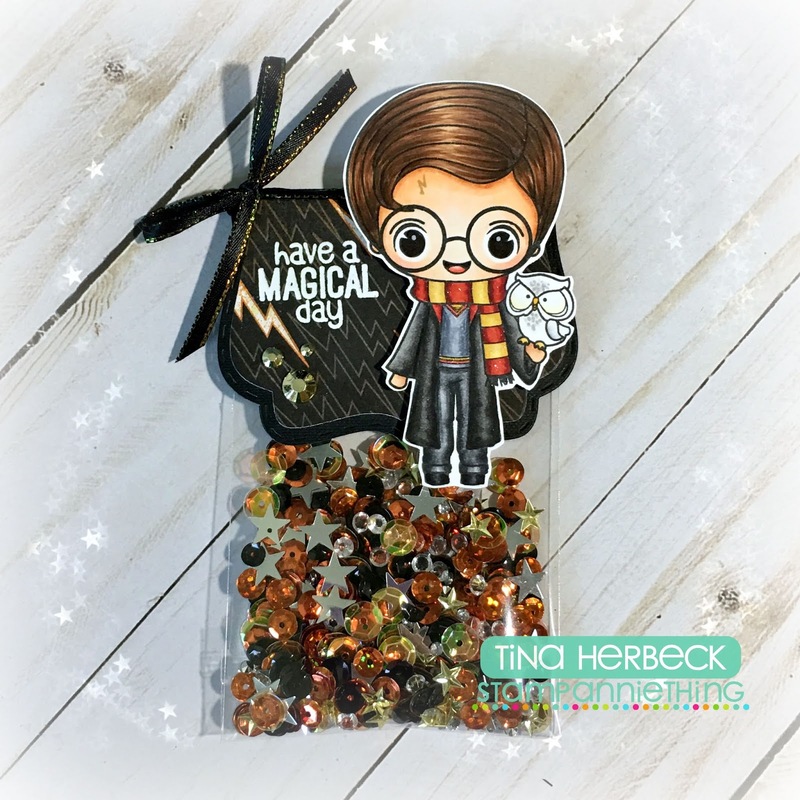 This is Tina from The Scrappin Rabbit blog and I have a fun project to share with you today! It features one of the adorable wizard stamps from the new Grab and Go Wizard's Box. I'm participating in a swap with a crafty friend and I decided to make a fun Halloween sequin mix for her. 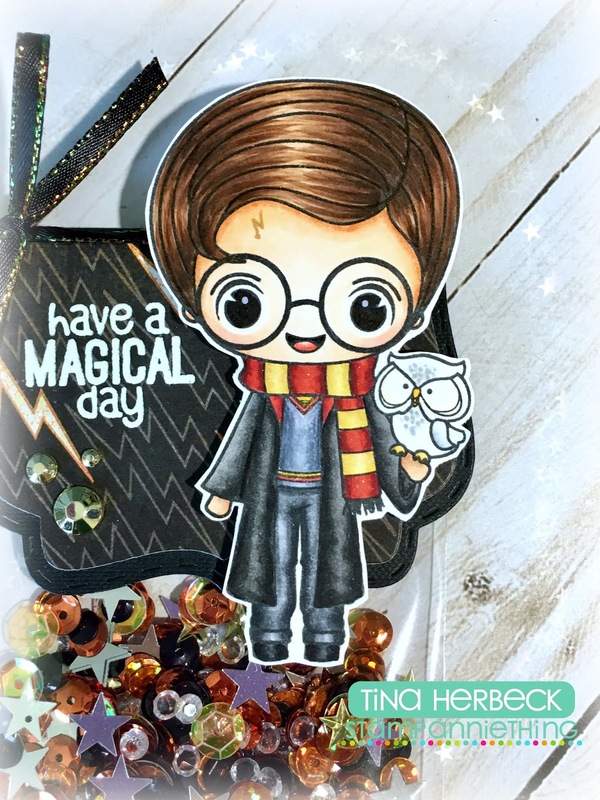 I colored up the wizard to look like Harry Potter, who is a fave of ours, and decorated the topper with him. The Fancy Topper Die is from Jaded Blossom.I stamped and embossed the sentiment and added some bling! I used the Brittney-Give Thanks digital stamp to create my card. This was a free stamp from last year but you can find others HERE. I stamped and colored Brittney with Copic markers and mounted her off to the side onto a mat I cut with the Goody Bag Die. 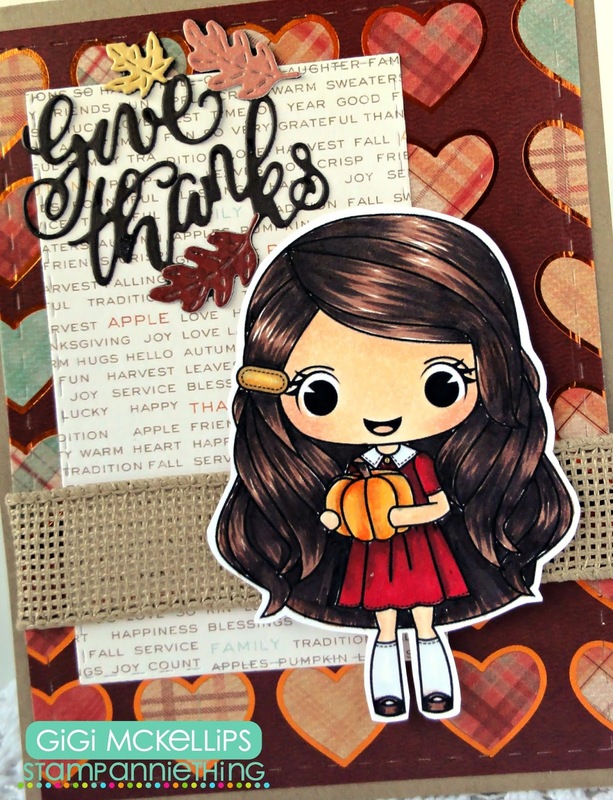 I added some jute ribbon to the background and finished it off with the Give Thanks Metal Die. I used Kelly - Happy and coloured her with Copic markers. 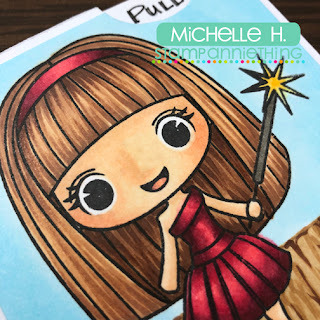 I created this card for a friend of mine and Coloured her to look like her. 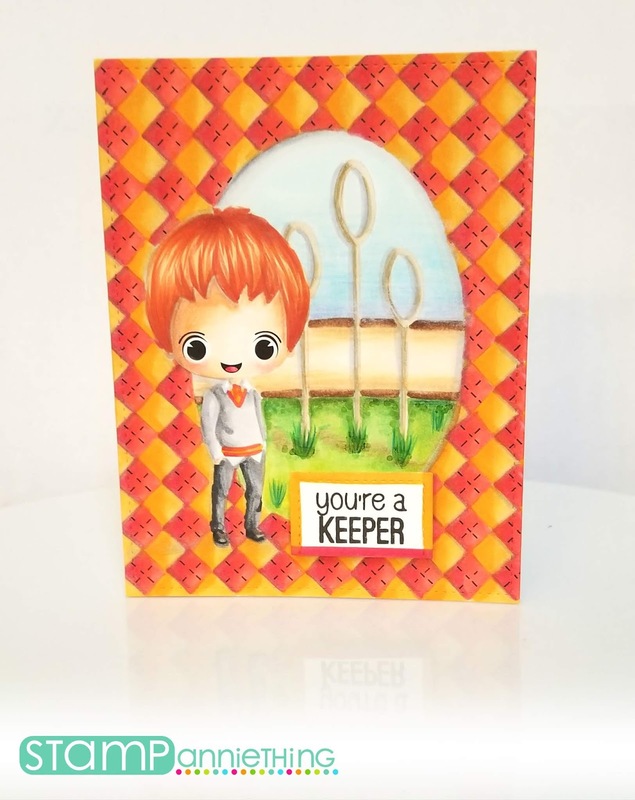 I created the background using using the Heart Reverse die, Falling Hearts stencil, and the amazing Stamp AnnieThing Hybrid ink cubes. Welcome to the Grab and Go! Premiere - The Wizards Box!! Also read below to see how to get a FREE digital sentiment that I used on a project below! Let's kick off my projects with Alex! He is a done in a no line ink version that I colored with my copics. 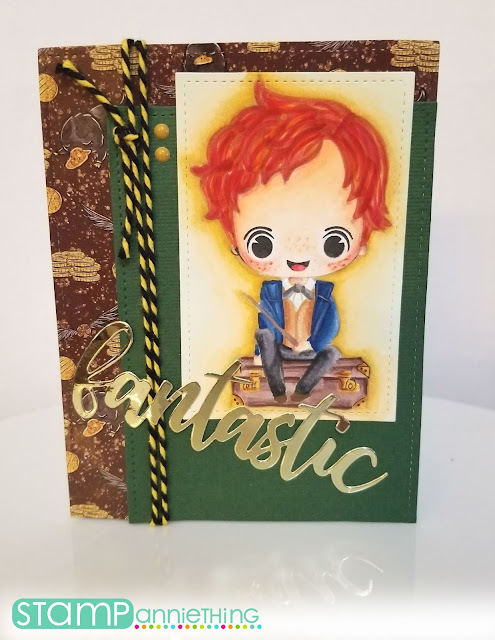 I used paper from the wizards box, the Magical Beasts Paper Pad and added a die cut using the Fantastic Word die cut in Gold Foil I tied it off with some Bee Sting Twine and Wizards are Cool Enamel Dots. Except for the card mat dies I used, everything else is included in the box! Next up is the Anthony stamp! Again I no line colored him with copics and created this fun background image of the Quidditch field. I used the sentiment from one of the stamps included in the box as well. Here is the sweet Chloe! I used all box items to make this sweet card. The Wizards are cool paper Pad, Wizards are Cool Cardstock pack, and enamel dots and twine. Everything you need is right in the box... how cool is THAT? Even the Foam POP up dots are included! You can NOT have a wizards box without the Chosen one, right? Here is Sam. How adorable is he? again, I used everything in the box except for the black twine (different colors in the box).... check out that Adorable OWL and Cage charm! It comes in teh box too! 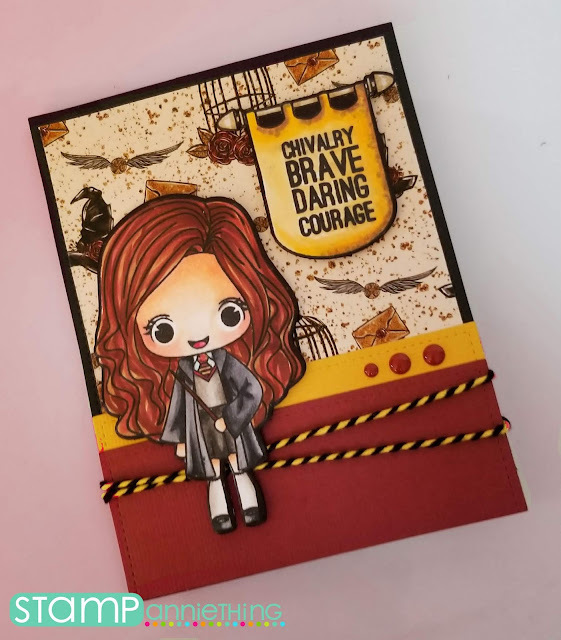 used the envelope provided in the box to make a matching card and envelope set. Here is the inside of my card, again, repeating the theme to make it all cohesive! 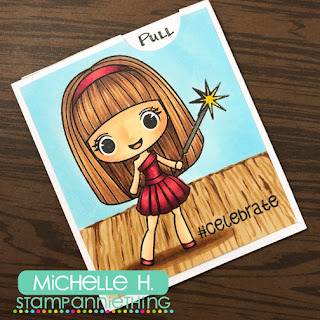 Here is a FREE digital stamp magical Sentiment I created as a fun treat for those hopping along with us today. Its in PDF file and is already sized to a 4.25 X 5.5 card size. 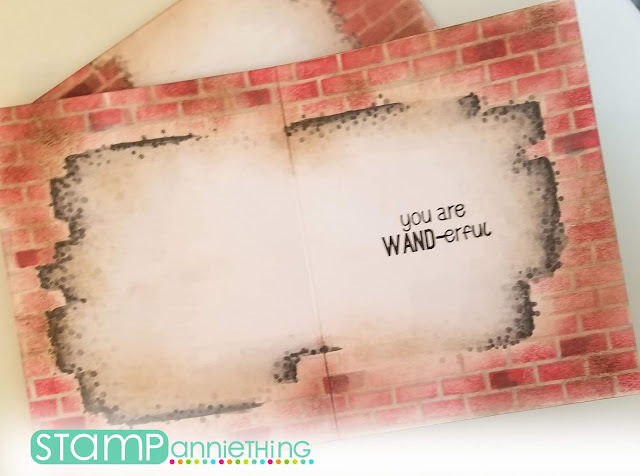 All you have to do is print it out, cut it down to fit the front of your card base and Voila, instant card. 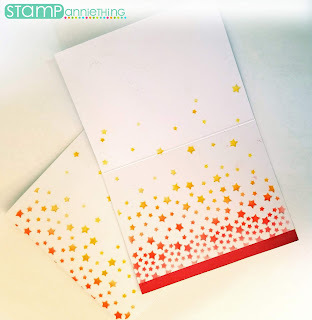 I also used the Falling Star Stencil with our totally YUMMY Hybrid Inks. I also created a matching envelope and inside of the card with the stencil. To get the download, simply CLICK here. Please hop along with the rest of the team below! 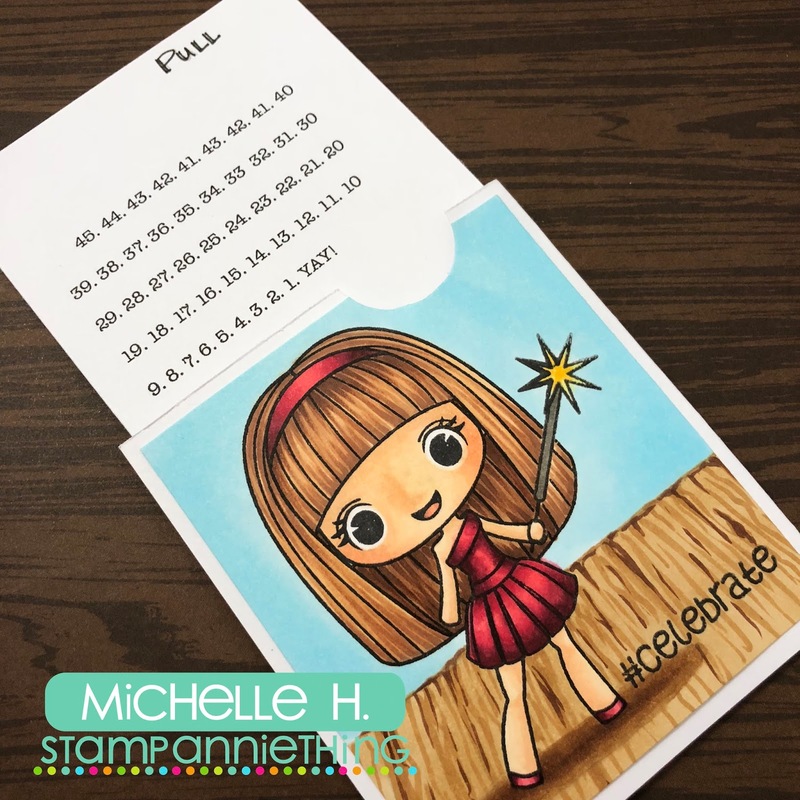 Hello firends:)Eunji here.Today I am making the magic card with our new stamp set. Let's look at my card. 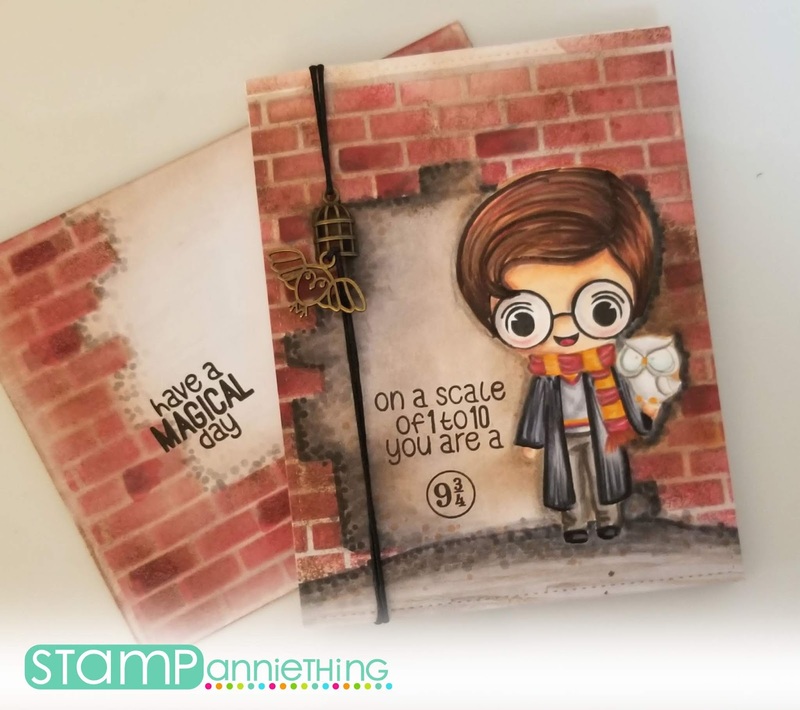 I started stamping the magic boy image stamp on maker paper from Wizards set. And blended with Distress ink on A6 size card stock. And don't forget our Blog Hop. No Lion, You're the Best!! Hi there, Nicole here today with a card to share. I used the "Falling Hearts" stencil for my background along with "Blossom Hybrid Ink" . I started by inking up my stencil from the top of the stencil and worked downward using a lighter hand as I worked towards the bottom of the stencil to create a variegated effect. Afterwards I went over the entire thing with the ink blender again and trying to continue with the variegated effect. The image and the sentiment are from "Zac-Lion-No Lion You're the Best". I embossed the sentiment with white embossing powder and attached a white enamel heart next to it. Hello Stamp AnnieThing friends and fans. Michelle Houghton here today with a very quick little burst of inspiration for you today. I created a little card for a good friend of mine to countdown days on. I colored up Stacey - #celebrate and made a pocket for her to sit on top of with a slide out counter card. I created a video so you can see all the coloring including the wood flooring that we did a little while ago live on Facebook. I made a Christmas scene card using Paige ~ Holiday Magic. She fit perfectly on this scene card with her holding a present!! 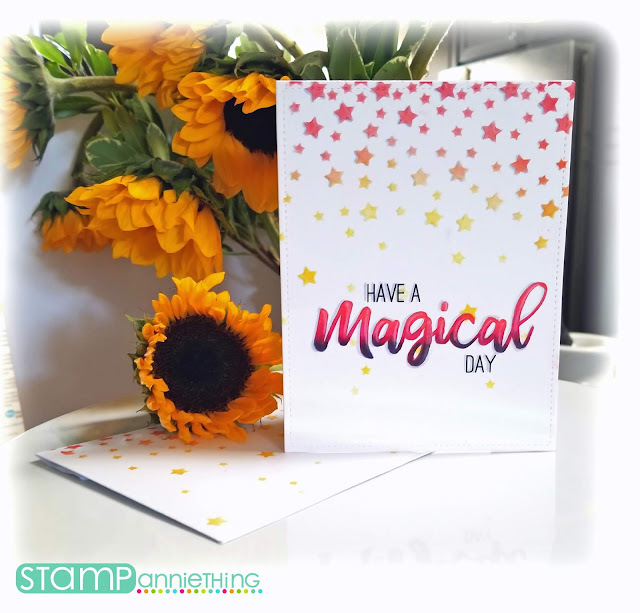 Stacey from Stacey's Creative Corner with you today to share a get well card that I made using one of those super cute stamps from Stamp Anniething. I colored Holly - Cheer Up with my Copic markers and cut her out using my Scan N Cut 2. 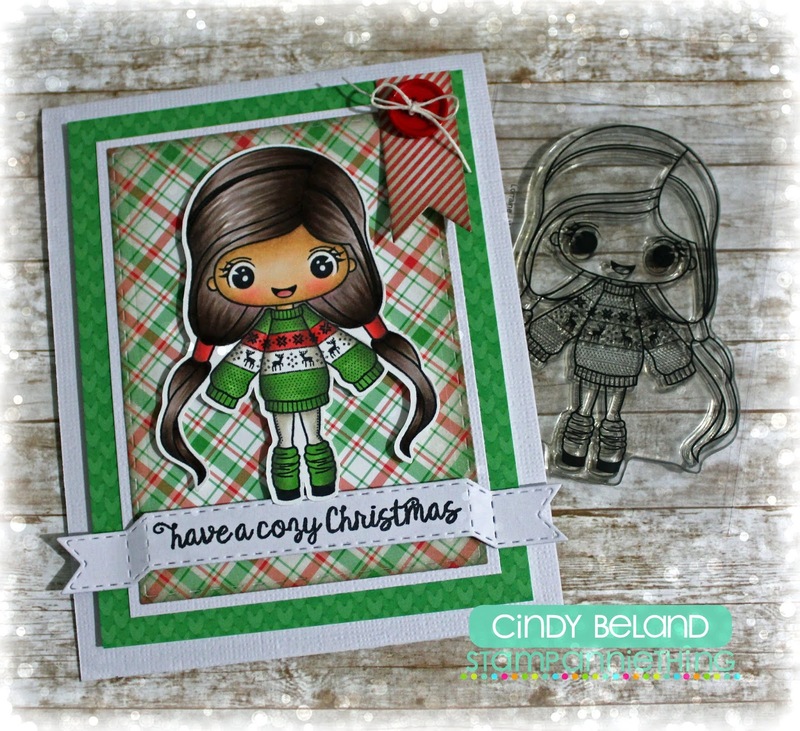 I added her to a white card base and stamped that fun greeting from Jaded Blossom. I added a strip of some fun patterned paper along with a red scallop border to the side and finished off my card with some crochet thread and bow. Super simple and easy!! Hi all! It's Meg here today to share another design using the new Star Car Mat die. I seriously cannot get enough of this new die! I love how I could use it here to make a view into dreamland. I even used the min-stars that came as part of the die! To create this card, I first cut out the center of the card with the die, then removed the center in order to stencil the background. I used the Diamond Ball Cross Hatch stencil for some "wallpaper", and popped it up on dimensional foam. Then, I created my background and recessed it in to the wallpaper pattern. After coloring up Holly - Sweet Dreams, I popped her up on dimensional foam as well, and adhered the sentiment with glue. Hello Everyone! 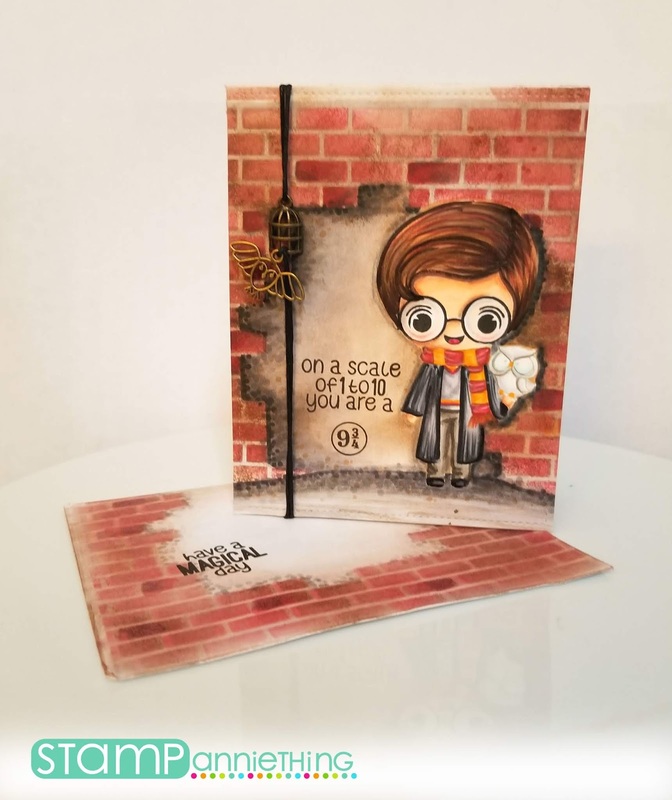 Melissa here from Doxie Mel Designs with a new card for you. I colored up Jane Hello Ladybug from the last release with Copic Markers. She is cute as a bug! I found some cloud paper from echo park for the background of the card. Ladybugs and clouds.. my favorites! Be sure to join our latest challenge #34 for a chance to win a new stamp of your choice. Follow the sketch and enter at our Facebook fan page HERE. 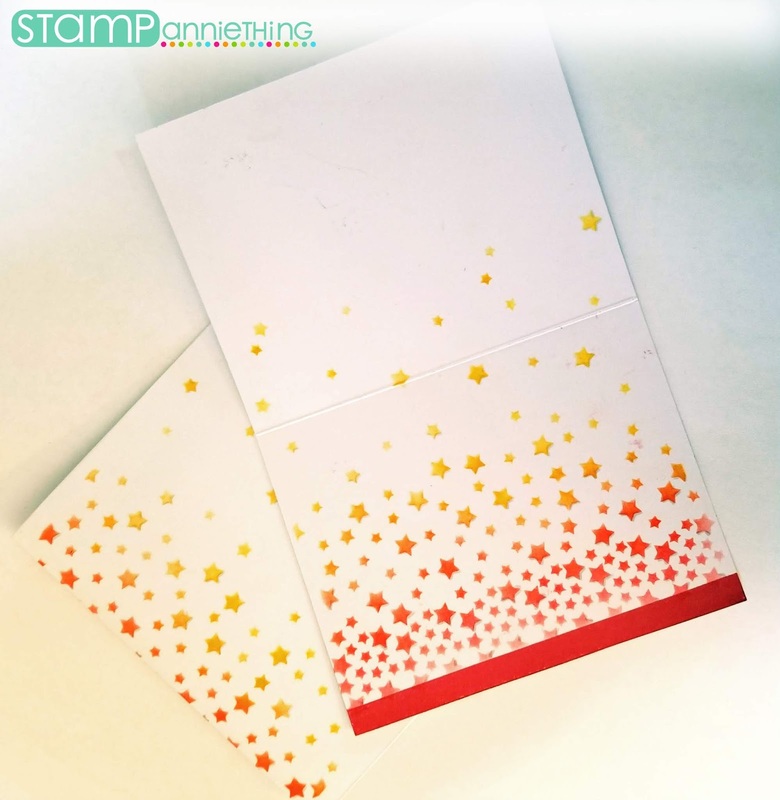 Request to join Stamp Anniething's Stamper Facebook Fan Page, HERE. Gotta Love a Card Sketch!